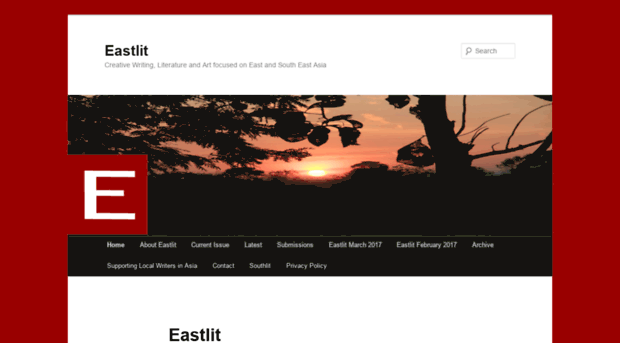 Eastlit is an English-language online journal and website focused on creative writing and art specifically from or connected to East and South East Asia, including Siberia and Mongolia. The editors now also offer an electronic supplement covering South Asia: Southlit. British expat Graham Lawrence, a writer, teacher and publisher, is one of the co-founders of Eastlit. His own writing includes the eBooks Broken Lines, a collection of tales, including autobiographical ones, that meander from London to South East Asia, and Tales from the Village, a collection of simple stories told to Graham, or else based on incidents witnessed by him, or actually involving him, on his Asian travels. Graham, a Brit married to a Thai woman, is a long-term resident of Thailand. He gave Asian Books Blog an interview, via e-mail. Why did you found Eastlit as an English-language magazine? Why did you think it was needed? The main aim first of all was to offer local and other writers a better chance at being published: to give an opportunity to writers never or rarely published before to tell a story. And having spent almost two decades in South East Asia, it seemed like something should be given back to a region that had served me well. My co-founder, Bryn Tennant, thought the same. I would say Eastlit was needed because there were too few avenues for East and Southeast Asian writers to tell the stories and poems of their regions and cultures using the medium of English. Breaking into the closed club of traditional publishing is not easy for anyone. Of course we also offer publication opportunities to published writers and those outside the region or diaspora who are focussing on Asia. Do you have any concerns about the dominance of English in worldwide publishing? If so: what are those concerns? If not, why not? It is not just publishing but the cultural imperialism in every facet of life. The publishing industry as a whole is not one of equality and equal access even to those who use English. Personally, I love the idea of publication in the local languages people use, not just nationally mandated languages, but it is a bit beyond my skill set to do anything about it. There should be diversification within the publishing industry. The industry itself has to take responsibility for its own part in assisting in the death knell of local languages that is on-going. Are you in a position to help Asian writers who choose to write in Asian languages, either by organising translation, or by putting them in touch with local-language publishers? If not, do you have any plans to develop a translation programme? I would love to do both but there are financial and time limitations. I have to live in the real world. If an opportunity came up though, I would definitely do what I could, and would love to be part of such an exciting project. We have published translations, but these have been arranged by the author. There have also been translations of pieces published in English into other languages after we have published them. That though has been between the author and the new language publisher. We also published the English translation of A Descendant of the Emperor Shang Tang by Minglu Zeng, and then after we had published it the original Chinese version was published quite quickly elsewhere. What is the balance between the numbers of pieces you include from Western expats, Asian expats within Asia, Asian writers living in their home countries, and writers living outside Asia, but choosing to write about the region? This has changed since we started. When we began we were heavy on both Western expats (should that read immigrants?) and writers living outside Asia but focussing on Asia. However, as time has gone on both these groups have diminished relative to Asian writers writing from their home country and writers of the Asian diaspora writing about Asia from elsewhere. In real numbers the Westerners have increased but the numbers of Asians has increased by far more. This year we average maybe 35% Asians from their own country, 35% Asian diaspora but elsewhere, 10% Western expat/immigrants, 15% Westerners writing about Asia from elsewhere and 5% others. From what I see of the editorial board votes, there is also a slightly higher chance now of an Asian writer being chosen for publication over a Western one. Are there any marked differences in choice of theme between the four groups? Do the Western expats write about being expats? Do people living outside Asia treat it as an exotic and mysterious region? Are your South Asian writers fixated on writing about the post-colonial experience? It is not easy to generalise. One thing we wanted to avoid when we started out was Western-written man-meets-bad-bar-girl stories, and we haven’t published many. The South Asian contributors do seem to concentrate a little more on the post-colonial experience. But on the whole it is people from different perspectives trying to explore what’s going on in a rapidly changing and important region. I don’t try to over analyse it. Can you say a bit about your editorial board, and how it works? It consists of a few dozen people. They are all volunteers, and I rely totally on them. (Thanks, dudes you know who you are!) The board is exactly 50-50 female/male. Some of the members have MFA’s while others are just avid readers. We try to get our board to mirror to some degree the weird eclectic mixes you find among literature lovers. A majority of the board are not Westerners and a large minority now consists of non-native speakers and writers of English. The board is divided into teams and each month each team receives a bunch of things to read. The only instruction I give the members is: think if you would want to read this piece or not and vote accordingly. They vote yes/no/don’t know to every piece and then I add up the votes, so it is a democratic process. There is no conferring in smoke filled rooms. What do you think about the rise of self-publishing, specifically as it relates to authors living in Asia? Do you see Eastlit as being a sounding-board, or testing-bed, for authors thinking about self-publication? Eastlit is basically a self-published journal, and I am a huge fan of self-publishing. Self-publishing has the ability to do to the stagnant publishing industry what was done to the stagnant music industry. Anything new and dynamic will always advance people in a way the decaying unchallenged traditional cannot. Self-publishing is great as it means authors and poets no longer need to pander to the whims of the publishing industry. Any freedom from that institutional fetter to art has to be welcomed. Poets and authors in Asia are also a long way from the huge publishing industry of the West and local publishing houses tend to be old, dozy, and too-easily influenced by money or connections. I would also like to add that I have had friends and contacts show me their work and I have found some of it amazing and have advised them to self-publish, but many want to follow the dream, so they approach an agent or publisher - whereupon they get advised to make wholesale changes! In every case the end result has been no publication, disillusionment, or a horrible book. My advice to writers is: go for it and self-publish. After all you may just have the next 50 Shades of Grey, which started out as self-published eBook. How do you think contributors see Eastlit? I don’t really know - this is more of a question for those contributing to us. I just hope we fill some small void in what struggling poets, writers and artists need. We get a mix of contributors who have different reasons to submit. Sometimes I receive e-mails that are addressed to 200 journals offering the same material. Unless the material has an overt Asian theme I usually write back personally - no form letter - and ask the contributor to tell me in a sentence or two how their work connects to Asia. Do many of your contributors go on to self-publish? Some do, yes, and one, Pauline Lacanilao, has even put on an interactive visual art-poetry exhibition. Whether those who went on to self-publish were helped by Eastlit I don’t honestly know, but as long as we fill some gap I guess we will stay relevant and continue to grow and most importantly serve the need we set out to serve. What about traditional publishing? Have any of the authors you’ve published gone on to sign traditional publishing contracts with local publishers as a result of publication in Eastlit? I have found that in general traditional publishing houses have kept their distance from us. That is their choice, and we know we do not fit into their world. We also have absolutely no intention of forming formal links with any publishing house. If Eastlit assists our contributors in any way to achieve what they want, that is enough. If publishing houses want to follow what we are doing and approach our contributors, fine, but we are not looking to become some part of the industry. That said, we do support new publishing enterprises that offer authors and poets a chance. Bob D’Costa, one of our contributors, has just started such a venture in India – Whatabook. Thanks to Iain on our editorial board, Flora Qian who submitted Massey Hall 1971 to Eastlit had another piece Farewell to Mr. Caterpillar published in Empty Places of the Bantuan Coffee Foundation - this organisation supports the victims of child prostitution in Indonesia. Mai Van Phan, some of whose poems translated from Vietnamese we published, has had several collections published in Vietnamese. There have been contributors who have been published by international publishers. Iain Maloney has had First Time Solo released and Silma Hill is forthcoming. Anna Yin’s poetry collection Inhaling the Silence is also available. Once again though, I would not want to claim credit for Eastlit in any way. These publications, as with all, are down to the poets and writers. I prefer to think of Eastlit as just a small thing that is a small part of our many contributors' writing lives. Apologies to anyone I’ve forgotten to mention. There are just so many successes. Have contributors found success in non-book formats? Films? Games? Eastlit contributor L.P. Lee had the short film House of Locks released while The Pilgrim, first published in Eastlit September 2013, by Simon Rowe was adapted to a screenplay. How is Eastlit funded? Are you supported by grants from educational establishments, or similar? Eastlit has absolutely no funding, but is entirely supported by me with a few donations to help out. It is and will remain a labour of love only. There are no plans to go commercial in any way. It would be nice to have some funding but there is no way we will agree to any form of editorial control or influence. What are your hopes and ambitions for Eastlit? How would you like to see it develop over the next 5 years? I just hope that in 5 years we are continuing to serve a need for writers, poets and artists focussing on Asia. I think if we keep an open mind, listen and remain adaptable that is achievable. I want us to be part of telling the stories that are coming out of East, Southeast and South Asia. Anything else you want to say to writers and readers in Asia, about Eastlit? We welcome poetry, fiction, non-fiction and artwork from anyone anywhere focussing on East, Southeast or South Asia. If anyone has any ideas or proposals please do contact me. I am really looking forward to trying a few new things in the coming months and years. Contact me on editors@eastlit.com, or via Facebook.